Every once in a while I get a very specific craving for a burger. Not just the patty itself, but the bun, tomato, and the whole deal. I wanted to do something a little different this time, so came up with these super yum Green Chile Turkey Burgers, infused with green chiles, cumin, and pepper jack cheese. They did not disappoint. Originally posted 1-19-14, updated 5-5-18. 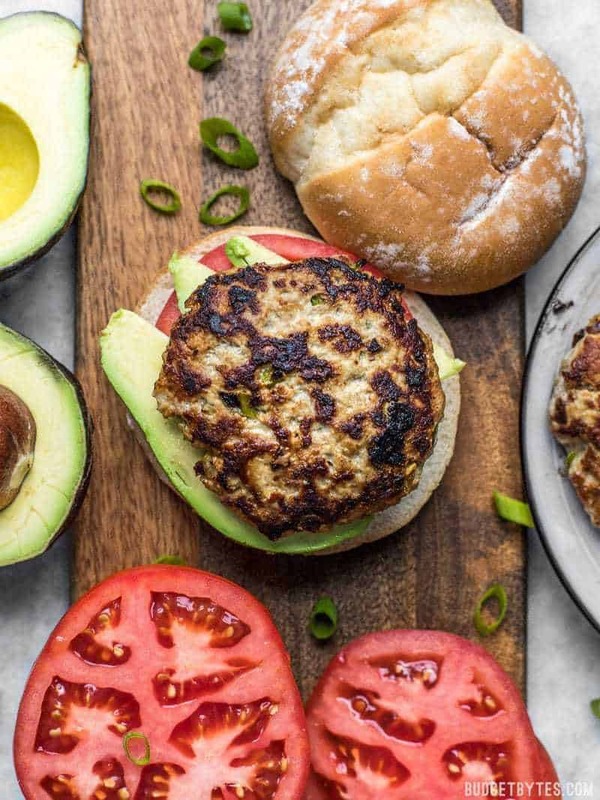 These Green Chile Turkey Burgers can't be beat for a fast, flavorful weeknight dinner. Healthy, ready in about 30 minutes, and full of southwest flavor. 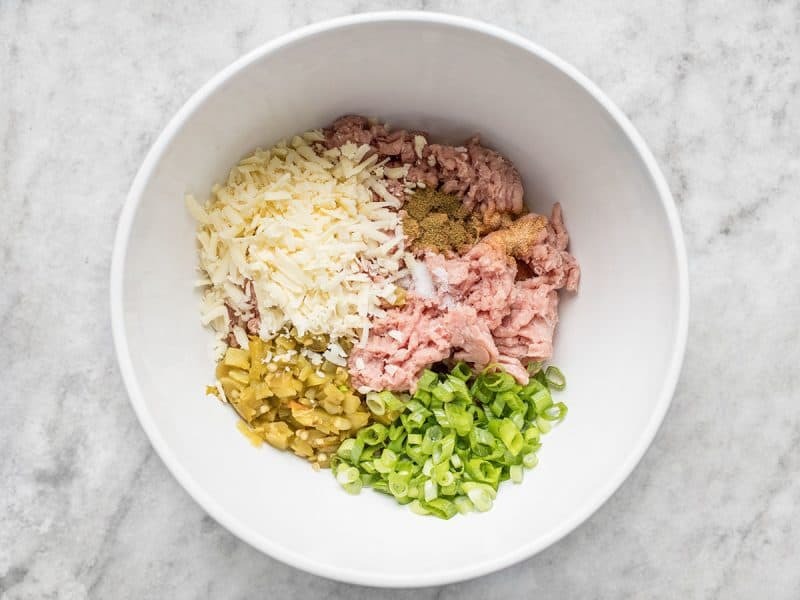 Place the ground turkey, green chiles (drained), sliced green onions, shredded pepper jack, cumin, garlic powder, and salt in a large bowl. Mix the ingredients until well combined. Divide and shape the mixture into five patties. The mixture will be fairly wet. 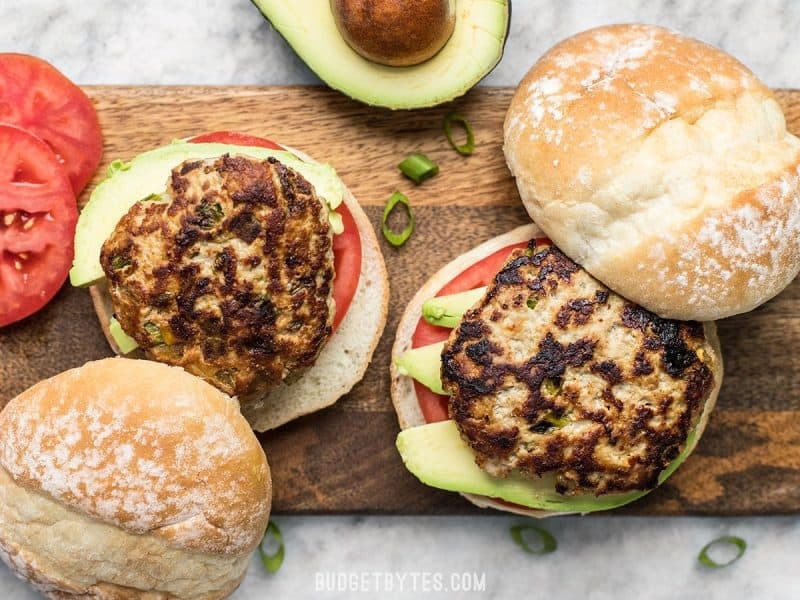 Cook the burgers in a skillet, on a grill, or using an indoor grill like a George Foreman, until they are cooked through (internal temperature of 165ºF) and well browned on the outside. 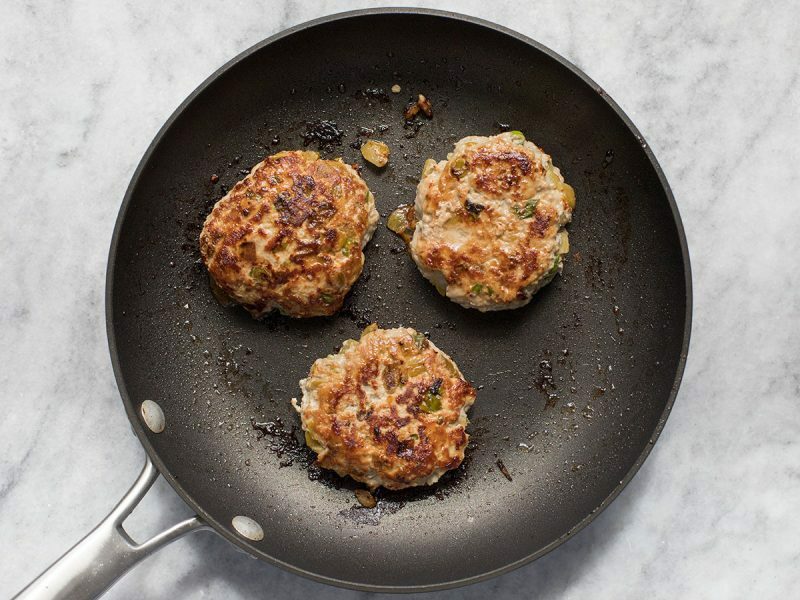 Cooking time will depend on the method, size, and thickness of your patties. 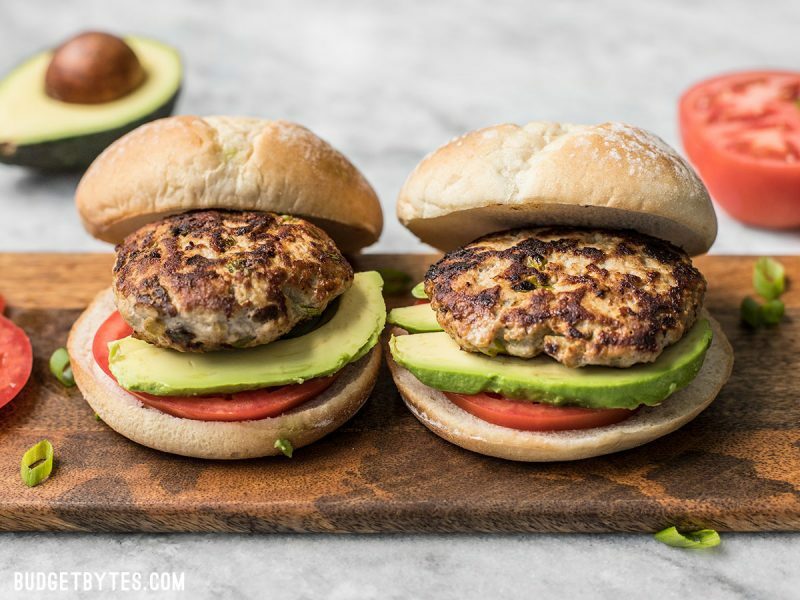 Serve each patty on a bun with a slice of tomato, a couple slices of avocado, and a smear of mayonnaise. Use an instant read thermometer to make sure your burgers are cooked through. Then mix them all together until well combined. This mixture is pretty wet thanks to the green chiles, but I was still able to form them into patties. They held together well when cooked. Divide this mixture into five equal portions (that’s about 1/4 lb. per burger) and form them into patties. Cook the burgers in a skillet, on a grill, or on an indoor grill like the George Foreman, until they are cooked through (internal temperature of 165ºF) and browned on the outside. I suggest using an instant read thermometer to make sure. They’re not very expensive and incredibly useful in the kitchen. 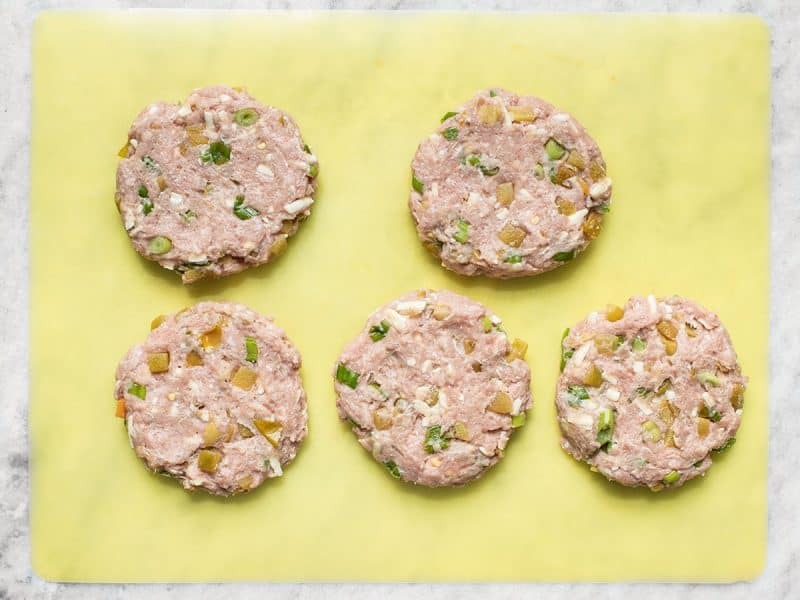 Top your Green Chili Turkey Burgers with whatever you like. I added a slice of fresh tomato, some avocado, and a light smear of mayo. SO GOOD! Made this tonight with ground chicken (just can’t bring myself to like ground turkey). So good!! I made these for my partner and he said it was the best burger he has ever eaten! I am so proud because I’ve never cooked with turkey before, let alone ground turkey. Neither had I ever tasted a turkey burger (I’ve only started cooking about a year ago and as I child it was pretty much always pantry food, so this is a great accomplishment for me). The patty was so amazingly moist, and seriously even just by itself it is finger-licking good. De-li-cious! 11/10 would make again, it tops any burger I’ve ever eaten! I am going to try these for lunches. Any ideas for a condiment to make to put on them? I usually make Tzakziki for greek turkey burgers, wondering what would go well with these. These were amazing and super easy to make! After not having a home cooked meal for 3 weeks, this was the perfect combination of quick and tasty! I did have to add some bread crumbs to help the patties stay together better. The cheese and green chiles were an awesome combination and the burger itself was super hearty. 5 patties was just the right count for this recipe too! Great flavor! I was feeling lazy and baked the 6 thin patties I made in the oven for 15 min at 425 degrees. A lot of liquid came out of them so they sure weren’t pretty,but they were so good! They were still moist. I didnt drain the green chilies at all. Will definitely make again. Mine were too soggy to hold up even after I made sure to get most of the liquid out of the green chillis. I blame the ground turkey I bought. Ended up eating my scrambled turkey “burger” in a lettuce wrap with normal burger fixings like avocado, jalapenos, red onions and tomatoes. Super yum. Made these last night! SUCH a winner. I used ground chicken (organic and raised without antibiotics was on sale, so I couldn’t pass it up) and it worked SO WELL. I topped with a slice of pepper jack instead of using shredded in the burger, and served with chipotle roasted purple sweet potato wedges (I just tossed them in olive oil, salt, pepper, and chipotle powder — highly recommend as a side!). Added tomato, avocado, and a little mayo to the burger. Another winner of a recipe. This is my new favorite. I like it so much I have the extras for lunch….YUMMY YUMMY! Hello, I found your site 2 1/2 weeks ago and made a list of 8 to 10 recipes to try. I made the Green Chile Turkey Burgers on first and have followed with some others that are out of my comfort zone (Asian style) dishes. After about 4 recipes my wife expressed that she didn’t know where these recipes are coming from but keep them coming. But she has mentioned these burgers over all the rest. They will be made on a more frequent basis for sure. 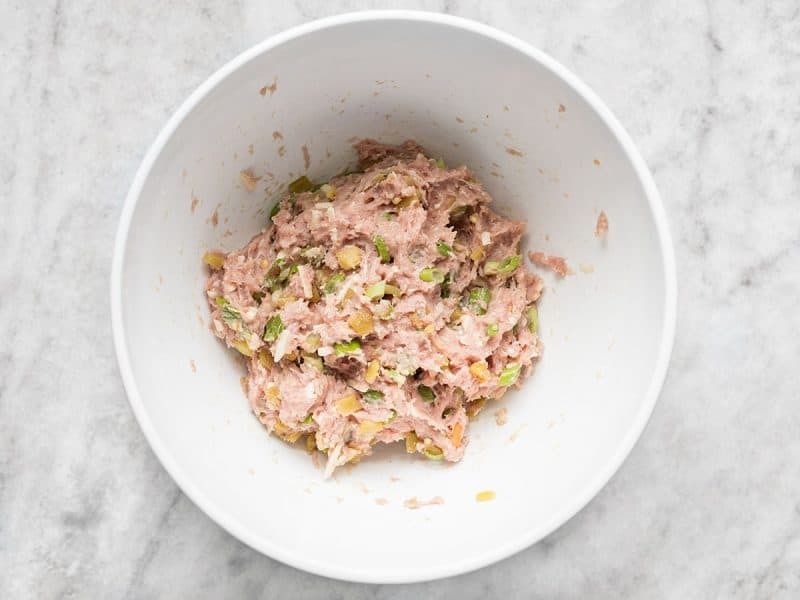 I have on opinion based question…I was thinking of making these into meatball form with some pasta, can you think of any light gravy that could go over it? I have made some jalapeño pickle gravy before and thought maybe to try that recipe and sub out the pickles for chopped green chile’s? Any opinion? Hmm, I’ve never had a pickle gravy so I’m not sure about that, but maybe a creamy/cheese sauce made with pepper jack? You should use the sauce from the white bean and spinach enchiladas recipe on this site. SO. GOOD!! Putting these on my next meal plan, but I’m planning to sub ground beef because I just can’t even with the ground turkey. Idk what it is…I think maybe the smell of it? But I’ve wanted to try this recipe forever because the flavors sound great!